We’ve always wanted to create an index to the surviving narrow gauge railways in Poland, but have always baulked at the amount of work involved. But finally, by working over two days we have managed to prepare the first edition. We’ve given each railway a ‘health rating’. The first two traffic lights indicate the current status, and the last two indicate the state last year. Basically those lines with a double green light are OK. They are the ones that we don’t worry too much about about. (Wola Michalowa-Przyslup) The most famous narrow gauge railway in Poland, and the only one able to afford to maintain a regular scheduled programme of track repairs. The trackbed is owned by the Fundacja Bieszczadzkiej Kolejki Lesnej – the only heritage railway operator in Poland to own its own right of way. A project, funded by the Carpathian Foundation, to extend the railway is to the PKP station at Nowy Lupkow is underway. (Gniezno – Anastazewo ) Formerlt the Gnieznienska Kolej Dojazdowa, the railway was the western section of the Kujawy Railway System. The railway carried freight until PKP abandoned its narrow gauge railways in 2001. In 2002 Gniezno District Council took over the railway and appointed the Gniezno Society to be its operator. (Gryfice-Rewal) A fragment of the Pomeranian Railway metre gauge system. The title to the trackbed has been acquired by Rewal Town Coucil. The line is a very popular tourist attraction and enjoys strong backing from Rewal Council who have formed their own operating company which runs the line. A skansen (outdoor railway museum) at Gryfice contains a large collection of metre gauge rolling stock, including items from the former Grojecka Kolej Dojazdowa. A major EU-funded project to refurbish the railway is ready to roll. (Znin – Wenecja – Biskupin – Gasawa) Arguably Poland’s first tourist narrow gauge railway. Regular passenger traffic ceased in 1962, although freight traffic continued for another 40 years. However, some 10 years later, PKP started a three train a day service during the tourist season to take tourists to the narrow gauge railway skansen set up in 1972 at Wenecja and the prehistoric lake village at Biskupin. In 2002, the Znin District Council and the Gasawa Town established a railway company which continues to run the tourist service. Bytom-Tarnowskie Gory-Miasteczko Slaskie) A section of the once extensive 785 mm gauge railways that connected the coal mines and power stations of Silesia. The previous green and amber reflected the precarious financial and security status of the railway. The track connecting the railway to its extensive workshops – the largest narrow gauge railway workshops in Europe – was stolen several times. This year the local council have at last agreed to fund some of the railway’s most basic needs, hence the double green. (Piaseczno-Tarczyn; there are plans to rebuild the line to Nowe Miast nad Pilica) This railway is part of the former Grojecka Kolej Dojazdowa sysyem. This very popular railway line has made progress by leaps and bounds. Once the private playground of a Polish Heffneresque figure, the Piaseczynskie Towarzystwo Kolei Wąskotorowej now accepts applications for membership and runs a regular all the year round Sunday service. The society has also conducted a heavy overhaul of its Px 48-3917 steam locomotive. However, there a complicated ownership strucure which makes applying for grants difficult. The line is owned by PKP, which licences it to the District Council, which licences it to the Town Council, which licences it to the Society, hence the green and amber rating. (Pionki only; there are plans to rebuild the line to Garbatka Letnisko) This forestry railway was closed in 1981 and all the track was lifted. In 2002, a project was announced to rebuild the line from scratch. The venture is being led by Pawel Szwed the chairman of the Fundacja Polskich Kolei Waskotorowych and enjoys the support of all the local authorities and the Forestry Commission. The engine sheds and workshops have been restored and the track in the immediate environs relaid. Apart from a chronic shortage of funds, the future looks bright for this project. (Opatow-Zbiersk Cukrownia-Turek; short branch to Russow) Freight workings have been cut back to Zbiersk Cukrownia following a serious derailment in 2007. Theoretically special trains can be worked through to Turek. There is a dispute with Turek Town Council which is demanding taxes for the railway land. (Rogow-Biala Rawska) Arguably the best ‘museum’ railway in Poland. The Fundacja Polskich Kolei Waskotorowych have done and amazing job of collecting historic narrow gauge rolling stock from far and wide and restoring it to a very high standard. The railway has a well managed team of volunteers. 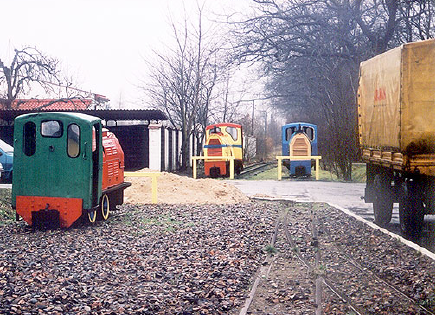 The reason for the ‘green and yellow’ is that, although the railway is owned by Rawa Mazowiecka town council, it only operates on a stretch of line at its Rogow end and only runs into Rawa Mazowiecka a couple of times a year. With Rawa not seeing any benefit from its ownership of the railway it’s only a matter of time until some councillor looks begins to wonder about the development potential of the railway land. This is after all what happened at Krosniewice and here the railway WAS operating a daily passenger service from the town! (Stare Bojanowo-Smigiel, regular week day services; some special trains run to Wielichowo) Smigiel Town Council has a licence to operate the railway pending acquisition of the title to the railway land. There doesn’t seem to be a long-term strategy for developing the railway. Some trains have been hauled by steam during the summer thanks to the railway hosting some engine driver courses courtesy of the Wolsztyn Experience. The dispute with SKPL over funding has been resolved. (Jedrzejow-Pinczow; branch to Hajdaszek) The line had a good 2008 season after rumours that it would close at the end of 2007. There is no single owner (each council owns its particular stretch of track) which makes decision making difficult. The railway operating company is owned by the District Council. (Czarna Bialostocka-3km; there are plans to restore the rest of the line to Kopna Gora) A much devastated forestry railway that is being restored by a dedicated team of volunteers. The project does not enjoy the whole-hearted support of the local councils. Hence the warning signals. (Mlawa-Makow Mazowiecki) Krasne Parish Council has a licence to operate the railway pending acquisition of the title to the railway land. The long-term strategy for the railway is being managed by the Lokalna Organizacja Turystyczna Polnocne Mazowsze, a tourism development board made up of various local councils. SKPL withdrew from an operating agreement with SKrasne Council in 2007, and the railway only ran on a couple of special occasions in 2008. A small diesel locomotive has been purchased and a bid for an EU-funded project submitted. (Przeworsk-Dynow) The other narrow gauge railway in the Carpathian Mountains. The only narrow gauge railway in Poland with a tunnel. The railway land is in the process of being taken over by Przeworsk District Council from PKP. Because of the losses incurred in operating the railway, SKPL were rumoured to have been planning to withdraw from their operating agreement. But it now seems likely that SKPL will continue to operate the line for another year at least. (Sroda Wielkopolska-Zaniemysl) A fragment of a much larger railway that once ran as far as Poznan. This railway is very popular with enthusiasts and all services are steam worked. Part of the line is being turned into a cycle path. The station throat in Sroda has been tarmacked over. The bridge over the PKP main line in Sroda is life expired. (Anastiewo-Przystronie) When PKP gave up its narrow gauge operations Polish, railway enthusiasts managed to get two local councils – Krosniewice Town Council and Gniezno District Council to take over the Western and Eastern sections of the Kujawy Railways. Sadly a dispute over rates led to no local council being prepared to take over the connecting central section. The enormous railway workshops at Sompolno have been gutted and the heavy engineering machinery sold for scrap. Amazingly in spite of a section of the line being lifted for turf mining, and another section turned into a cycle path, most of the track is still in place! (Krosniewice-Krzewie-Ozorkow; Krosniewice-Boniewo-Dobra; Krosniewice-Ostrowy) The Eastern section of the Kujawy Railway System. Following an approach by enthusiasts Krosniewice Council obtained a licence to operate the railway pending acquisition of the title to the railway land. SKPL became the operator. In March 2008, the Mayor of Krosniewice terminated the Council’s operating agreement with SKPL and closed the line. (SKPL were operating daily passenger services and freight services at the time.) The Mayor has informed PKP that it wants each of the councils along the route to take over its portion of line. Apart from one weekend in September when services were run between Krosniewice and Ozorkow the line remains closed. Of all the railways where we are involved, the Krosniewice Railway is the one which is getting the most attention. (Nasielsk-Pultusk) The line closed completely when PKP abandoned its narrow gauge operations in 2001. Unfortunately no local council could be persuaded to take over the line. Remarkably most of the track is still in place! We helped to organise a meeting of the local councils a couple of years ago and followed it up with a private meeting with the Mayor of Nasielsk. Alas our powers of persuasion were insufficient! For as long as the track remains down, the Nasielsk Railway remains on our radar. (Piotrkow-Sulejow) Passenger services were withdrawn in 1986. (The line ran alongside the Piotrkow – Radom trunk road.) Freight services ceased three years later. In 1990 a preservation society was formed which leased the line from PKP. Sadly they failed to obtain the backing of the local councils who opposed the reopening of the line. Occasional special trains ran through Piotrkow until about 2006 when all the track was lifted. Only the sidings (and a substantial amount of rolling stock) remains at the interchange with PKP at Piotrkow. This is the line where we wish if only… ! (Elk-Turowo; branch to Zawady-) The line closed completely when PKP abandoned its narrow gauge operations in 2001. Elk Town Council took over the railway. The line is currently worked by MOSIR, the Council’s sport and recreation department. NO OTHER STATUS INFORMATION AVAILABLE. (Bialosliwie to Lobzenica; also to branches from Czajcze to Wysoka and Niezychowo to Glesno ) This is a fragment of a much larger network. The line is worked by the Towarzystwo Wyrzyska Kolejka Powiatowa. NO OTHER STATUS INFORMATION AVAILABLE. Please note this is not a comprehensive list of all the ‘preserved’ narrow gauge railways in Poland. Rather it is a list of all the lines whose fortunes we are most familiar with. If we have no information as to the state of the relationship between the line’s ‘owner’ and operator or the strategic plans of either, the ‘colour light signals’ are black. If you can help us complete the list and bring the status reports up to date, do please write. This entry was posted on Saturday, 11 October 2008 at 23:59 and is filed under Uncategorized. You can follow any responses to this entry through the RSS 2.0 feed. You can leave a response, or trackback from your own site. The “caution” is given, that this is not a comprehensive list: my mentioning possible additional lines / systems here, is in a spirit of interest, not of adverse criticism. A couple of points re lines included in the list. Gryfice Railway: my understanding is that as well as Gryfice – Rewal, this outfit also operates the 9 km. onwards, Rewal – Pogorzelica: in fact, in the summer operating season, pattern is, shuttle service throughout the day between Rewal and Pogorzelica, with just one run each way per day from / to Gryfice (day’s first, and last, journeys), essentially to get loco and stock from / to base at Gryfice. And, there are hopes (however faint) for reopening of the section on eastwards from Pogorzelica to Trzebiatow – currently out of use because of poor state of repair.